Link to Chronicle article regarding funding issues effecting Metro and light rail. Article is also printed below. Facing a $49 million budget shortfall this fiscal year, the Metropolitan Transit Authority has begun to slow construction on two light rail lines and may embrace more drastic measures in the coming months as uncertainty grows over a $800 million grant from the Federal Transit Administration. Senior Metro officials emphasized that they did not anticipate any cuts to services due to the financial pressures and expressed confidence the FTA grant needed to pay for an estimated 30 miles of additional rail in Houston is forthcoming. But they nevertheless have begun to weigh the impact of continued delays on construction plans that anticipated completion in 2013. “There’s going to be some tough choices that we’ll be making here, no doubt,” Metro Chairman Gilbert Garcia said. So far, officials said, the work that has been put off has been minimal on the North line, which is expected to run from north Houston to the Texas Medical Center and Reliant Park. Metro has delayed road reconstruction work on Fulton Street and has put off awarding a contract for the expansion and construction of a rail facility on Fannin at the south end of the line near Reliant Park and the 610 Loop. Those delays could just mark the beginning, Metro’s Acting President and CEO George Greanias said. Metro’s budget had anticipated that the transit agency this fiscal year would receive some of the $800 million earmarked to expand Houston’s light rail in President Barack Obama’s 2010 budget. The grant money has been delayed amid an FTA investigation into Metro’s compliance with federal procurement rules. Metro also has struggled during the economic slowdown due to lower ridership and sales tax revenues. Garcia and Greanias said the board will hold several meetings in the coming months to discuss contingency plans for next year’s budget. They said those plans will depend on the status of the FTA’s investigation and whether the grant is approved in the coming months. This year, officials said, although Metro took in more than $260 million less than anticipated in sales tax revenues, grant funding, ridership fees and debt issuance, the agency expects to have a $49 million shortfall at the end of its fiscal year Sept. 30 due to lower spending. That shortfall will be closed using cash surpluses. Wednesday’s board meeting also showcased the findings of a private law firm that faulted the manner in which Metro conducted board meetings in the past and made more than a dozen recommendations about how the agency can improve its compliance with state laws regarding transparency. Neil Thomas, a partner at Fulbright and Jaworski, said the firm had been unable to assess how decisions were made at Metro board committee meetings due to insufficient records. “That lack of transparency bothered us,” he said. Thomas praised Metro’s efforts to improve how it retains documents after an open records lawsuit and complaints from a terminated employee embroiled the agency in scandal earlier this year. Still, he said cultural transformation would be more important than implementing a new policy. “Those cultural changes will ultimately make things work,” he said. Board members pledged to keep better minutes and comply with the recommendations. “We just want to make sure we’re following the rules,” Garcia said. Daphne Scarbrough, a longtime Metro critic who owns a business on Richmond where the University Line would run, said the agency is being forced to comply with state law and deserves no credit for the changes it has implemented to bring it in line with what is expected of all government entities. She praised Thomas’ report and said she and other Metro critics have experienced similar problems with previous committee meetings. In previous general meetings, the majority of residents have expressed interest in buying “sign toppers” for our street signs. The sign toppers are metal decorations that would be mounted to the top of all Richwood Place street signs to help define the neighborhood. We will need to get permission from the city to install the sign toppers. We need a logo/design that we own or that is within the fair uses of the license. We need to agree if the design, sign, and installation costs will come out of the general budget or if signs will be sponsored by a resident. We need to find and engage a contractor to do the installation. If you are interested in assisting with any of the above items, please contact Cliff or reply to thie post. We can further discuss our plans at the October 5th National Night Out on the 1800 block of Norfolk. 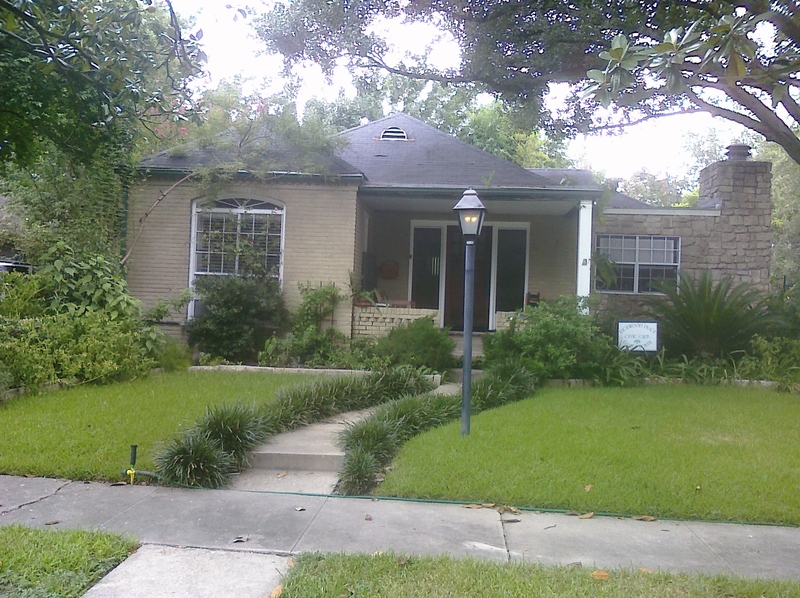 Congratulations to 1836 Portsmouth, this month’s Yard of the Month! 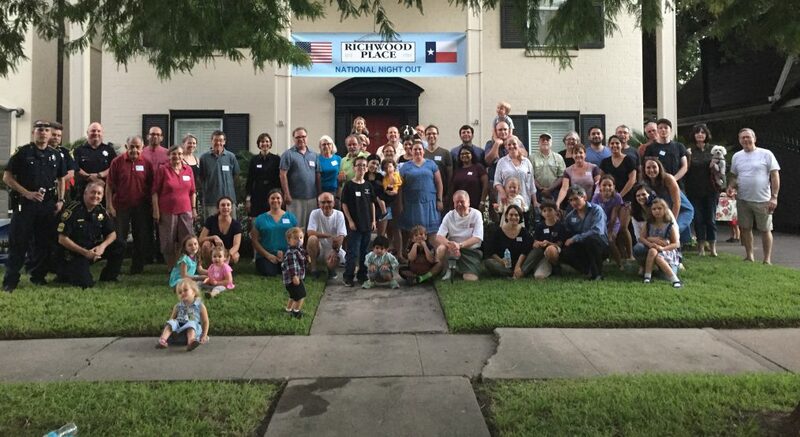 We’ll be having a general neighborhood meeting at 7pm this Tuesday, August 10th at Zoe’s Kitchen on Shepherd. The meeting will last an hour and cover ongoing issues in Richwood Place. Here is a PDF of a Mandell Place (north of Richwood Place) security update that itemizes a number of burglaries in the last few weeks.